This book is essentially in two parts, or almost two books in one, with each chapter written by a different expert author or authors. 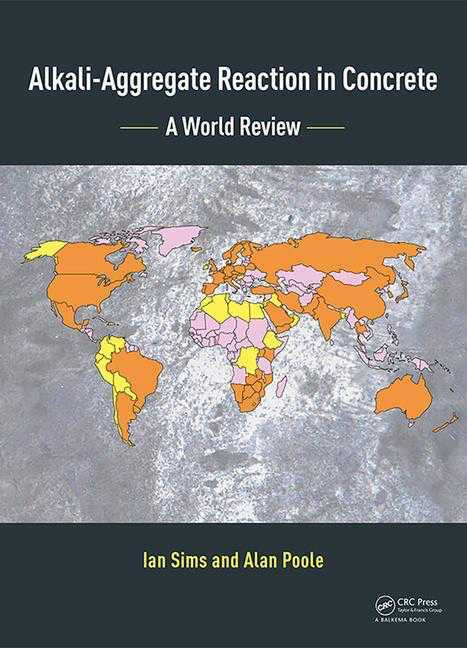 The first part, Chapters 1-5, is a comprehensive, authoritative and up-to-date review of alkali-aggregate reaction (AAR), including both alkali-silica reaction (ASR) and the “so-called alkali-carbonate-reaction” (ACR). Most of this first part of the book, and indeed most of the book, is concerned with ASR including the reaction process, identification and prevention of ASR and a discussion of how to repair or manage affected concrete. Chapter 3 (titled “So-called Alkali-Carbonate Reaction”) uses the term “so-called ACR” to indicate that damaging expansion is actually due to ASR in argillaceous dolomitic limestone and not as had long been assumed, to a reaction between the cement pore fluid and dolomite aggregate. In the second part of the book, each of the chapters (Chapters 6-16) focusses on AAR (ie: principally ASR) in different countries or subcontinents. Chapter 10, for example, covers the USA and Canada and Chapter 14 covers Australia and New Zealand. Each of these chapters was written by different authors, all experts in that particular region. The emphasis and detail varies to some degree between authors, but typically they describe the geology, the distribution of AAR, investigations of specific instances and measures taken to prevent or manage AAR. I cannot claim to have read all 768 pages (this would indeed take some months of bedtime reading) and I have concentrated mainly on the first five chapters. However, I have seen more than enough to be able to say that this is a superb book that is likely to be the principal reference on AAR for many years. I was offered the eBook version to review; this uses an app called “VitalSource Bookshelf”, which I had not seen previously. I had a few initial problems installing it and downloading the eBook, but it now works well. Despite my general preference for a printed book, I will grudgingly admit that the hyperlinks in the eBook (eg: to diagrams referenced in the text) are convenient. Through reading this book, my understanding of AAR has been greatly improved and updated and I’ve still got quite a few pages to read yet. UPDATE: I now have a copy of the printed book and I can confirm that it is in full color. From a quick comparison of random pages, it looks like what is in color in the ebook is also in color in the printed book. The book is produced to a high standard with good quality paper and feels as if it would withstand many years of hard use. I've already admitted that I prefer printed books to eBooks, a bias reinforced by the feel of this book and the quality of its printing. It is really a rather lovely thing in its own right.